It’s amazing what fantastic resources can be found on the internet. For example, there’s a wealth of information on the Group Settlement Scheme available on the National Archives of Australia website. The Group Settlement Scheme operated during the 1920s when the government was eager to encourage migrants from Britain to farm in the Wheatbelt and the South West. Settlers were offered free land and assisted passage and over 6,000 people arrived to take up the offer. However, many soon became disillusioned; most of the land was heavily forested and had to be cleared by hand and living conditions were harsh. On the website you will find lists of migrants and you can also read about their concerns as some of their letters have been digitized. To access this material, visit the National Archives website and, using the General Search option within RecordSearch, type in “group settlement western australia”. You then need to select those items with control symbol X22/5 which are in three parts. 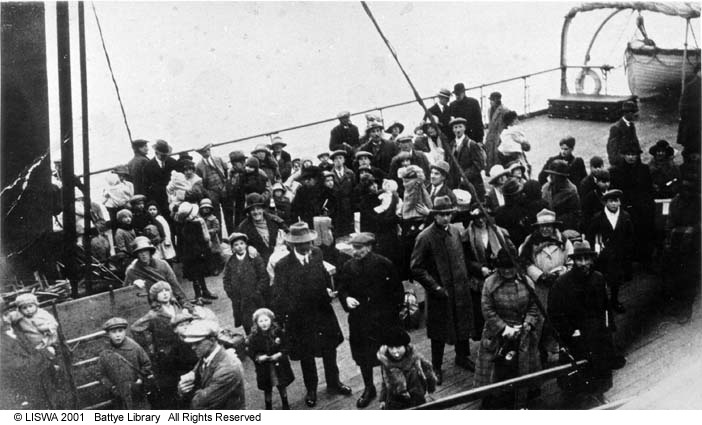 Part 1 covers the period 1921-1928 and includes an alphabetical list of migrants from England which gives details such as name, marital status, date of sailing, ship name, number in family, date of placement, group number, location number etc. There is also a list of Australians and non-approved migrants as well as information on the land such as stock numbers and number of acres cleared. Part 2 covers the period 1929-1933 and consists entirely of correspondence. Part 3 covers the period 1932-1934 and is a mixture of correspondence and migrant lists. Unlike the list in Part 1, this list is arranged in alphabetical order within area, so there are separate lists for Bunbury, Denmark etc. which give the same sort of information mentioned above. This entry was posted in Family History, WA history, Western Australia and tagged group settlement scheme by triciaf. Bookmark the permalink.